Cromwell — And now for something completely different. A smiling Gov. Dannel P. Malloy opened his annual holiday speech to the Middlesex Chamber of Commerce on Wednesday by comparing himself to a man prematurely given up for dead during the Black Plague, albeit the one who refused to go gently in an absurdist Monty Python comedy about the Middle Ages. It got laughs and applause. And so began Malloy’s sixth appearance at a sold-out breakfast that’s become a political touchstone in Connecticut, a place where 600 business leaders, administration officials and others show up early to get a good seat and see who landed a place at the long head table. Other governors played for humor, if occasionally edged with acid. Rowland resigned the following summer, a prelude to prison. Malloy’s first speech here in 2011 was a full-throated defense of a freshman year in which he attacked an inherited deficit with more than $1.5 billion in new taxes and a demand for concessions from the unions who helped elect him. His second year, he left no doubt that his audience should expect a serious speech reviewing the challenges facing Connecticut, not a comedy roast. Now at the midpoint of his second and most likely final term as governor, Malloy has the air of a man whose messaging no longer is moored to the needs of the next campaign. He talks about being a fan of Monty Python, the British comedy troupe with a genius for a surreal, if dark comedy. And he makes a virtue of stability. His administration still struggles with the budget and economy. Unable to deliver robust growth, Malloy talks about the stability he has brought to aerospace manufacturing, using incentives to entice Pratt & Whitney and Sikorsky to commit to Connecticut for its next generation of jet engines and helicopters, guaranteeing tens of thousands of jobs at the companies and their extensive supply chains. He cut a deal last week with a coalition of state employee unions to avoid an ever-growing series of annual pension payments, a consequence of bad decisions in decades past that threatened to destabilize Connecticut for decades to come. “We’re on the march. We don’t stop. Listen, it would have been great if we didn’t have to spend time paying the debts of former generations that didn’t contribute to pension obligations,” Malloy said. He says he inherited an unrealistic deal to stabilize the pension fund. A pension contribution of $826 million his first year is now $1.5 billion and was projected double to $3 billion in less than 10 years and then double again by 2032. The assumed rate of return on the pension fund is now 6.9 percent, down from 8.5 percent when he took office. Some economists and pension experts say that still is too high. He talked about Connecticut having the lowest crime rate in 50 years and a falling prison population that is both saving the state tends of millions of dollars and allowing the system to talk once again about rehabilitation, not just punishment. He praised his former chief of staff, Mark Ojakian, for stabilizing a merged system of higher education as president of the Board of Regents for Higher Education. Malloy said the system, as well as the University of Connecticut, is contributing to the economy with a skilled workforce. There is progress, even if it is slow. After the speech, Malloy stood in front of a Christmas tree to take questions about his message. He shrugged off a suggestion he was giving Connecticut a pep talk. The next question to the over-caffeinated governor, who had just finished an exhortation about the importance of being positive, was about an early morning headline: An announcement by Bristol-Meyers Squibb that a facility in Wallingford would be among five to be closed nationally, costing about 500 jobs. In other words, enough of the pep talk. 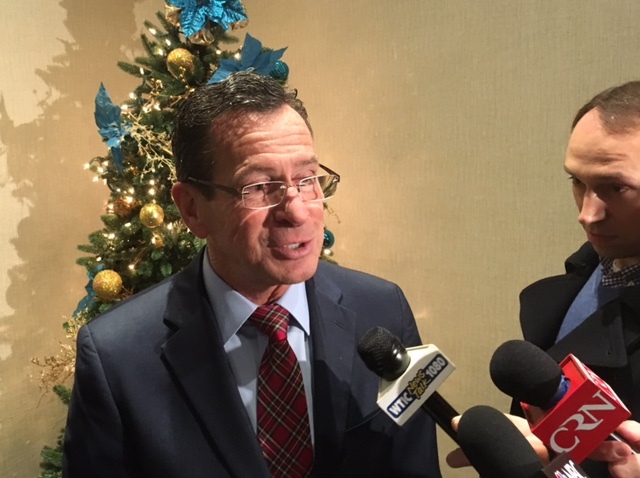 Malloy quickly tacked and said the cutback was a reflection of changes in an industry, not Connecticut as a place to do business. It was a bit jarring. A Monty Python fan might have found it funny.